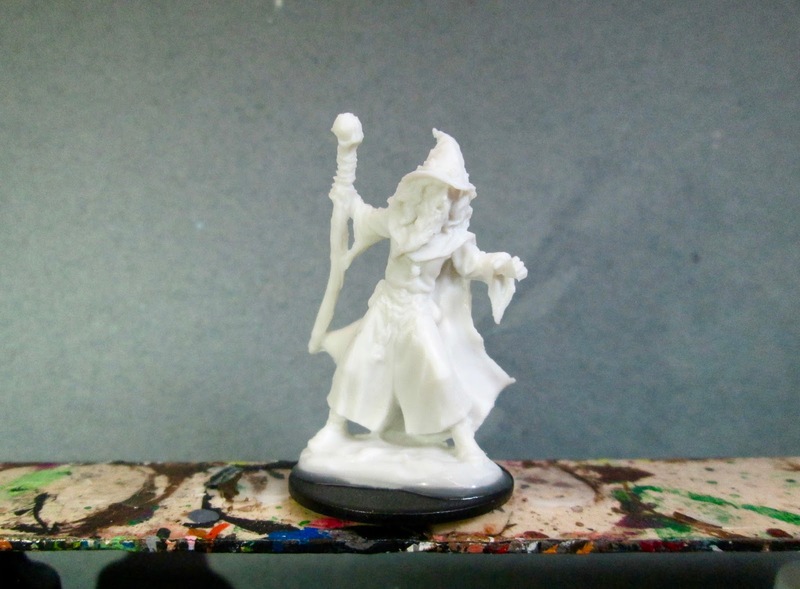 Lendil Blackroot, Wizard: Bones 3 Figure | H.A.W.K.S. 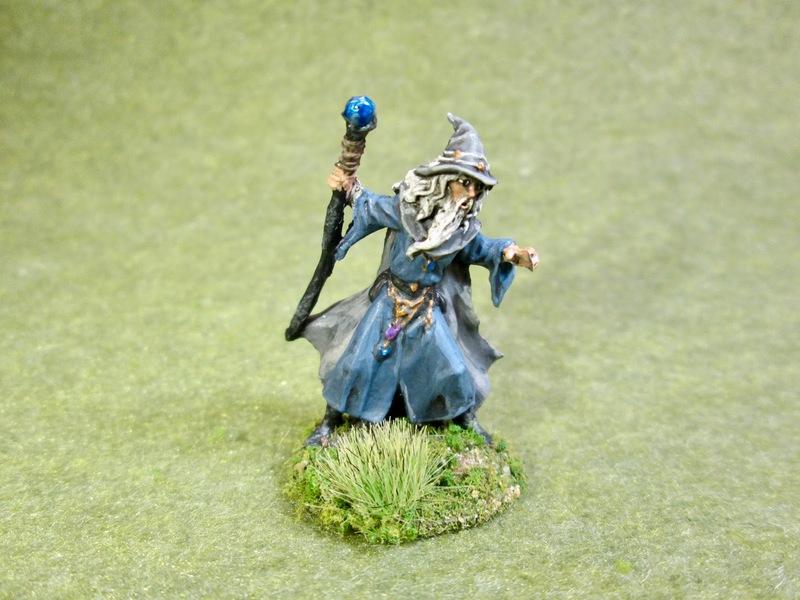 This past week I got back to panting figures for Ghost Archipelago, and painted Lendil Blackroot, Wizard, from the Bones 3 Original Core Set. 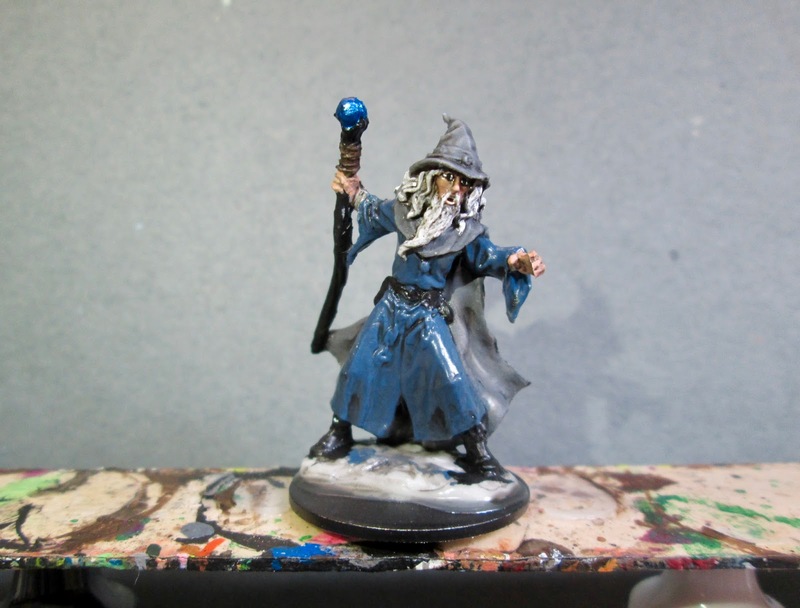 I plan to use this figure as a Storm Warden in the game, so decided to start off with a blue and grey color scheme. I liked how the pose of the figure almost looked like he was standing in a strong wind. I prepped the figure in the usual way; soaking it in a dish of water with a couple drops of dish-soap added, then giving it a light scrub with a soft toothbrush, and then rinsing and drying it. I then glued the figure to a black-primed 1" fender washer with Aleene’s Tacky glue, and then glued the washer-mounted figure to a tongue depressor with a couple drops of the Elmer’s glue. I began by painting his face and hands with Reaper MSP “Tanned Skin”. 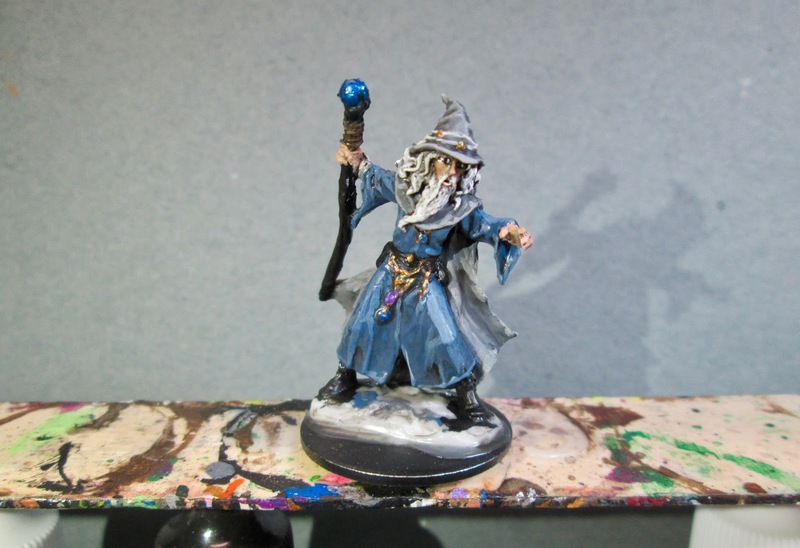 I then painted his robes with Citadel “The Fang”, and his cape and hat with Americana “Zinc”. 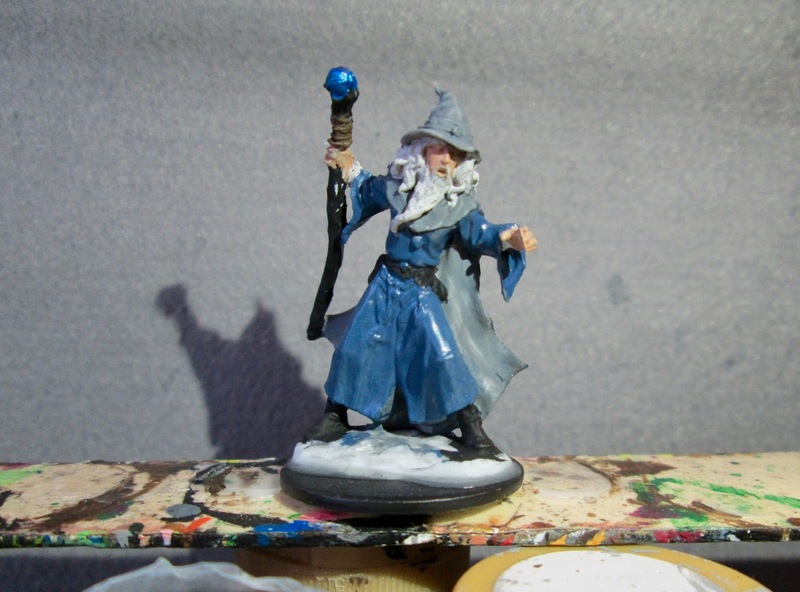 Next, I painted his boots, belt and staff with Black, and then painted the orb on top of the staff with Folk Art “Metallic Blue Sapphire”. I then painted his hair, and his inner sleeves with Americana “Dove Grey”, and the rope wrapping the top of the staff with Americana “Raw Umber”. On the back of his cape, I took a bit of foam from a blister insert, and using some Black, and a bit of the “Dove Grey”, tried to dab a bit of storm cloud pattern onto the cape. Then, when the figure had a while to dry, I gave the whole thing a wash with Citadel “Nuln Oil Wash. When this wash was dry, I painted his eyes, and then highlighted his skin with firs the base "Tanned Skin”, and then Reaper MSP “Tanned Highlight”. After that, I highlighted his hair with first the base “Dove Grey”, and then plain White. Next, I highlighted his robes with Folk Art “Cloudy Day” mixed with a little of “The Fang”. 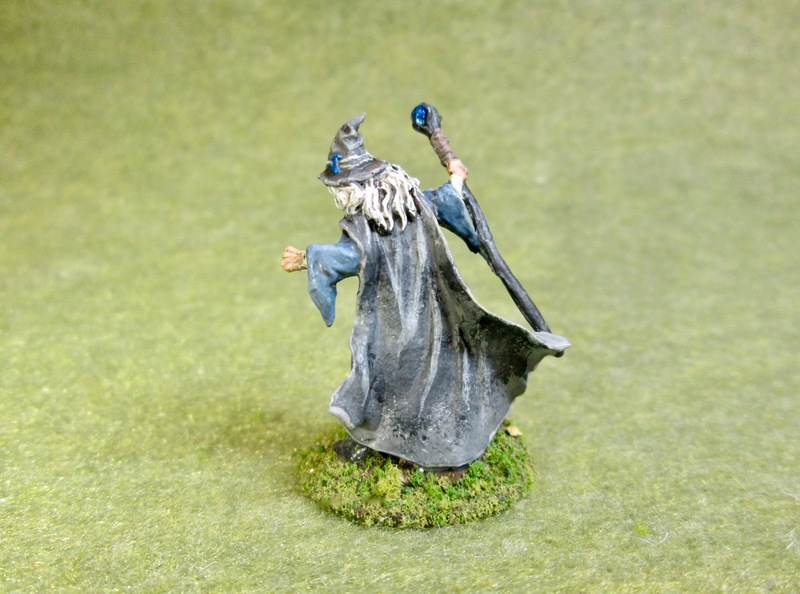 and I highlighted his hat and cape with Crafter’s Acrylic “Storm Cloud Grey”. I then went back and painted the cord wrapped around the base of his hat with Folk Art “Platinum Grey”. After that, I did some quick highlights on his inner sleeves with Folk Art “Porcelain White”. I painted the chains on his belt, his medallion, and a couple of the charms on his hat, with Cermacoat Bronze. I then painted one of the charms on his hat, the stone in his medallion, and one of the charms on the belt, with the “Metallic Blue Sapphire”. The other charm on his belt I painted with first Anita’s Violet", and then over-painted it with Folk Art Color Shift “Purple Flash”. I wanted the charms hanging from his belt to stand out a little bit more, so I traced around them with some Reaper MSP “Grey Liner”. I then turned my attention to his staff, and highlighted the shaft with Aleene’s “Slate Grey”. I also used this color to highlight his boots. Next, I highlighted the wrap on the top of the staff with Americana “Mississippi Mud”. I did a highlight on the orb with Folk Art Pearl “Aqua Moire”, and then over-painted the whole orb with Citadel Technical “Soulstone Blue”. Lastly, I painted his base with the “Raw Umber”. Here’s a look at the storm cloud pattern I tried to sponge onto the cape. I don’t think it really reads as storm clouds, but still looks ok as just a mottled pattern for a Storm Warden’s cape. Overall, I’m pretty happy with how he turned out. 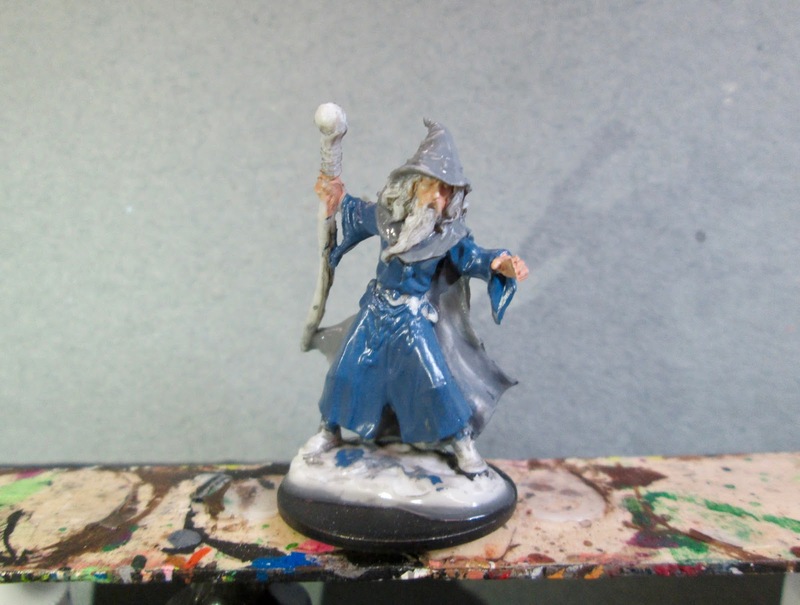 He perhaps looks a little too Gandalf-y; but the sculpt, and the color choices I made for the type of Warden I want him to represent, kind of lends itself to that.